Such has been the Anglo-American team’s amazing success since entering the European Le Mans Series in 2016, the 4 Hours of Le Castellet staged in warm sunshine at the Circuit Paul Ricard in Southern France today (15 Apr) can only be summed up as character-building. 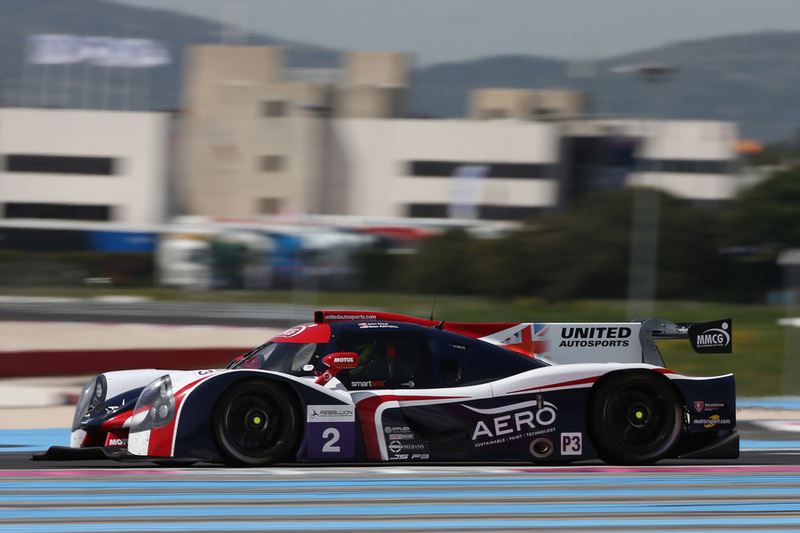 In what was United Autosports’ 13th ELMS race, it recorded ninth and 12th in LMP2 while the double reigning LMP3 ELMS Team champions placed fifth and seventh in the P3 category in the 2018 opener. Unscheduled pit-stops for both LMP2 cars and a drive-through penalty for the #2 cost the team dearly. It marked only the second ELMS race the team had failed to record a podium finish in either class since April 2016. United stays on at Ricard to test both of its LMP2 cars tomorrow. The second round of the ELMS is staged at Monza in Italy on 13 May which will see Filipe Albuquerque back behind the wheel of the #22 Ligier alongside Hanson, Bruno Senna substituting for the Portuguese, absent racing, and winning, in IMSA this weekend. An ELMS record LMP2 entry of 19-cars saw the United duo line-up 14th (#32, Owen) and 17th (#22, Hanson) for the 12noon start this afternoon, the #22 (Senna) having encountered an electronics glitch from the off in qualifying the previous afternoon. After 15 minutes, the #32 & #22 lay 12th and 15th respectively before Hanson pitted with a left rear puncture after contact with another car on 18 minutes dropping to 18th. Owen, who pitted (fuel/two left tyres only) with 42 minutes gone, was 10th at one-quarter distance as Hanson, restricted by a broken exhaust caused in the earlier incident, stopped for fuel and left tyres in 12th. Boyd took over the #32 from Owen on 85 minutes but served a 10 seconds hold penalty for an earlier overtaking infringement. The Northern Irishman, contesting his first LMP2 race, resumed 10th but immediately pitted again to have his right-hand seat belt fastened, losing six precious places – four cars behind Hanson who pitted (fuel/rear tyres) on 101 minutes. #32 pitted (fuel) while Senna took over the #22 from Hanson under a Full Course Yellow with almost two-hours on the clock, the race resuming with the United cars now one lap down in 14th (#32) and 15th (#22). De Sadeleer (#32) and Senna (#22) sat in ninth and 12th at three-quarter distance, Wayne having impressively moved the #32 inside the top-10 with both cars taking on fuel and left-hand tyres nearing the three-hour mark. Hanson was back in the #22 for the final 30 minutes, bringing his ailing Ligier home 12th – three places behind the sister #32 car of de Sadeleer. United’s pair began the race placed fifth (#2, Rayhall) – as he did at Ricard last August – and sixth (#3, Bell) in the 18-car LMP3 field having previously scored podium finishes here for the past two years including victory last year courtesy of eventual champions Falb/Rayhall. They made up places in the opening laps and ran second (#2) and fourth (#3) with 30 minutes gone. Both cars pitted together with an hour gone from third and fourth, having ran line astern, Grist taking over the #3 but no new tyres. On 90 minutes, United’s duo placed second (#2) and fifth (#3). Rayhall pitted the #2 to Falb while Wells took over the #3 from Grist under FCY nearing mid-distance, the pair resuming after a Safety Car period in second & fifth – both cars unluckily going a lap down due to the positioning of the Safety Car and class leader. Falb had to serve a drive-through penalty with 40 minutes remaining for an illegal overtaking manoeuvre, dropping him to fifth, one-place ahead of Wells who came home seventh. "It was a great shame Phil had the issue at the start of the race because we had a good racecar today. Because of the loss of engine power we couldn’t show our true potential. Qualifying was frustrating with an electrical issue right at the beginning. After the pit-stop I only had time for two flying laps and I got traffic on my quicker lap, so it was a nightmare. It was good to drive with Phil and I’m looking forward to racing with him at Watkins Glen in IMSA." "I had an old front right tyre for my stints and I struggled until the fuel load went down. I worked on my consistency and I seemed particularly unlucky with traffic. My pace was as good as the leaders at the end which was pleasing. We made changes to the car after FP2 and it was improved but still tricky to drive in qualifying. Unfortunately, on what was looking like my fastest lap, I hit a dislodged bollard and understeered off the track." “I was happy to qualify P5. John and I started from the same position last year and came away with a win but not this time around. Fifth place in the race is a really good start to the championship points-wise. There are good things we can take away from this weekend to work hard on getting us back on the podium at Monza! I want to thank United Autosports for the mega job they did all week and all their hard work!"